At ToorCon 11, Joshua Wright handed out a pre-release version of his KillerBee framework, a set of tools for analysis of 802.15.4 and ZigBee wireless networks. 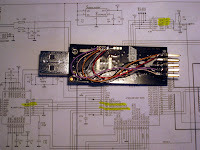 KillerBee requires a particular hardware device, Atmel's AVR RZUSBSTICK, an inexpensive USB dongle with a programmable microcontroller. Many of the KillerBee functions require custom firmware (written by Joshua) to be flashed onto the stick. 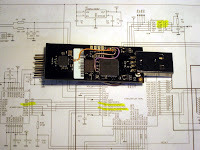 While most Atmel products feature In-System Programming (ISP) which can be done with a low-cost programming device, the RZUSBSTICK unfortunately only provides a JTAG header for programming, and the JTAG debugger/programmer costs about $300. The good news is that ISP can be used to program the RZUSBSTICK. The bad news is that it requires some tricky soldering to get it working. With a little guidance from those who have gone before me and SparkFun's excellent surface mount soldering tutorials under my belt, I was able to attach a 10-pin ISP header to my RZUSBSTICK and successfully flash it with the KillerBee firmware. I ran all six wires through the unused holes of the (unpopulated) JTAG header in order to provide some strain relief. Those connections to the individual chip pins are fragile! From there I ran them across the back of the board to a 10-pin header glued to the end of the stick. Now to find some target devices. . . The BusPirate supports OpenOCD, yes. But OpenOCD doesn't support the AVR. So, no. Is it possible to program these devices using a parallel cable? good work, I'd soldered the jtag an now I need the hex file to program the rzusbstick. can you please help me out. avrdude currently supports the BusPirate and can be used to flash the chip. The stick in the post has a sticker but mine didn't. Under the sticker in the pictures, by the AT86RF230 you'll find 3 vias in a straight line. they are the SCLK, MOSI, and MISO signals. scrape the solder mask off and it should be a lot easier to solder to than the QFN pads. But you should not use the pictures. On my RZUSB the JTAG header is different. To determine were pin 1 is look for pin 57 (TCK) on the AT90USB1287 and follow the wire (under the solder mask) to the JTAG header. This is pin 1.